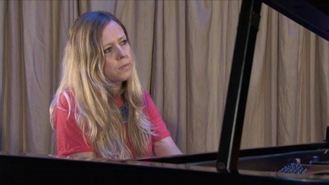 Singer-songwriter Daisy Chapman wrote Last December after seeing the letters sent from France to Elizabeth Brain whose husband was killed while fighting with the Warwickshire Regiment on the Western Front in August 1917. His widow died months later and the letters were kept by their family who gave them to BBC Radio Bristol for the WW1 At Home project. Daisy, whose song is being played on the station this morning, said: " When BBC Radio Bristol asked me to write a song based on letters received from France in the First World War, it didn't take me long to realise what a big job it was. "I really needed to do justice to the letters and particularly to Lizzy whose perspective the song is written from. I started off by reading up on First World War history and what life was like in the trenches where her husband was, but then quickly had to forget the detail, remembering that Lizzie would have been home in Bristol with little to no information on what was happening out there, other than a few letters. "I imagined her gazing out of her window to the east to try and pick up a sense of what her loved one was doing. And I hope that came across in the lyrics. It really has been a very special project, and I'm particularly honoured to have been singled out to take part." The project, which sees the BBC team up with the Imperial War Museum, will broadcast more than 1,000 local stories over this year and the next about the war.